I love lamb! Most especially, because I don’t eat beef, I just find that lamb is a much better substitute than let’s say, pork, in recipes that call for beef. Unfortunately, here in Canada, lamb is not that common. You’ll usually only find a very small selection of (frozen) New Zealand lamb in the meat section of most big supermarkets, and it’s much pricier than other meats. Still, I like to to buy lamb every now and then. If you like meatballs, why not try something different and use ground lamb? This delicious appetizer is easy to make and uses basic ingredients found in Mediterranean cooking, such as onions, garlic and fresh basil. 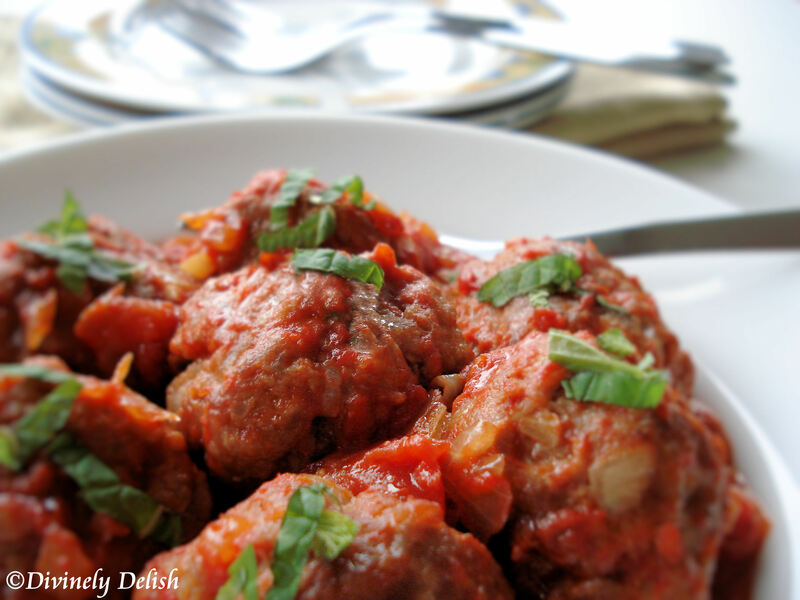 The thick, rich tomato sauce keeps the meatballs juicy and the mint rounds out the flavour. 1) Using hands, combine all ingredients for the meatballs in a medium bowl, except for the mint. 2) Shape level tablespoons of mixture into balls. 3) Cook meatballs in batches, in a large, oiled non-stick frying pan over medium heat, until browned all over and cooked through. Remove meatballs and set aside. 4) Heat oil in a medium saucepan, cook onions, garlic and pepper, stirring, until onion is soft. Add puree, stock and sugar. Bring to a boil and simmer, uncovered, about 10 minutes or until sauce is slightly thickened. 5) Add in meatballs and cook until heated through. 6) Serve topped with mint.